The Senate Homeland Security and Governmental Affairs Committee can hold contentious hearings some days. Today was not one of those days. Instead, the Senators got to talk about dogs. The committee held the Dogs of DHS: How Canine Programs Contribute to Homeland Security hearing Thursday with witnesses from the Transportation Security Agency, Government Accountability Office and Customs and Border Protection testifying about the merits of canine programs at DHS in airports nationwide. The committee also witnessed demonstrations from three canine units. TSA inspector Doug Timberlake and his partner Reverso were introduced first. Named after bond trader Joseph Reverso who perished in the Sept. 11, 2001, terrorist attacks, the four-legged Reverso sniffs out bombs. Reverso and Timberlake detect explosives at Ronald Reagan Washington National Airport near D.C. Timberlake explained how the canine program within TSA compares to the screening technology at airports. "There's no machine that can detect explosive materials the way a canine can," Timberlake said at the hearing. "[The machines] cannot reason and problem-solve to find the source of the substance." Maggie @TSA works through a blizzard at @Dulles_Airport near #DC. TSA has over 997 funded National Explosives Detection Canine teams working points of entry, according to Kimberly Hutchinson, deputy assistant administrator of TSA's Office of Training and Development. The program began in 1972 and Hutchinson called it a "prime example of federal, state, and local governmental entities working together." Customs and Border Protection agent Jennifer Jones and her partner Hudson also demonstrated a way the agency uses canines. 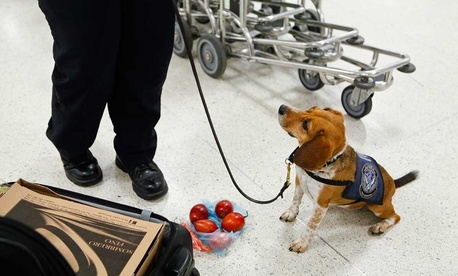 Hudson sniffs out fruits, seeds, plants and meats that are being brought into the United States via Florida, where Hudson and Jones work. Jones said Hudson runs "about 95 percent accurate most days" in his duties. "He has found everything from a single grape to about a hundred pounds of horse sausage," Jones said of Hudson. CBP agent Patrick Dowling brought his partner, Nicky, a Belgian Malinois trained to find currency and firearms at Virginia's Dulles International Airport. Nicki mostly inspects outgoing flyers from Dulles. "He's found about three million dollars in about two years," Dowling said of Nicky. Sen. Ron Johnson, R-Wisc. presided over the hearing, joking with the handlers and introducing it by saying he had been looking forward to the hearing and that it was "a couple of years in the planning." During Hudson's introduction, Johnson joked about having a beagle of his own during his childhood, but that his dog was "plumper." Ranking member Tom Carper, D-Del., referenced his own beagles, Jack and Jill. Johnson said he wanted to evaluate the costs and benefits of DHS's canine program since the committee allocates funding for it. Johnson was photographed in November touring the Penn Vet Working Dog Center when Sen. Pat Toomey hosted him. The training center trains dogs for law enforcement. It was established at University of Pennsylvania in 2007 to study dogs and added the training facility for detection canines in 2012 according to Executive Director Cindy Otto, D.V.M., Ph.D. The center trains most of the dogs for federal law enforcement. Watch the complete hearing below. The video starts at 16:00 .